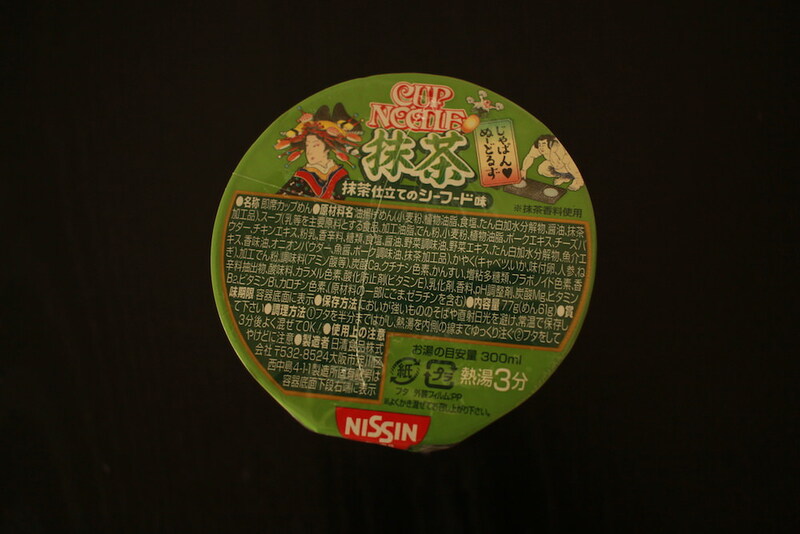 Almost a month ago, Hub Japan posted news about Nisshin producing a new CUP NOODLE flavor; matcha green tea! It’s so interesting that Japanese put matcha on everything. I was so curious how the matcha CUP NOODLE would taste like, so when I found it selling at a convenience store, I could not resist buying one. 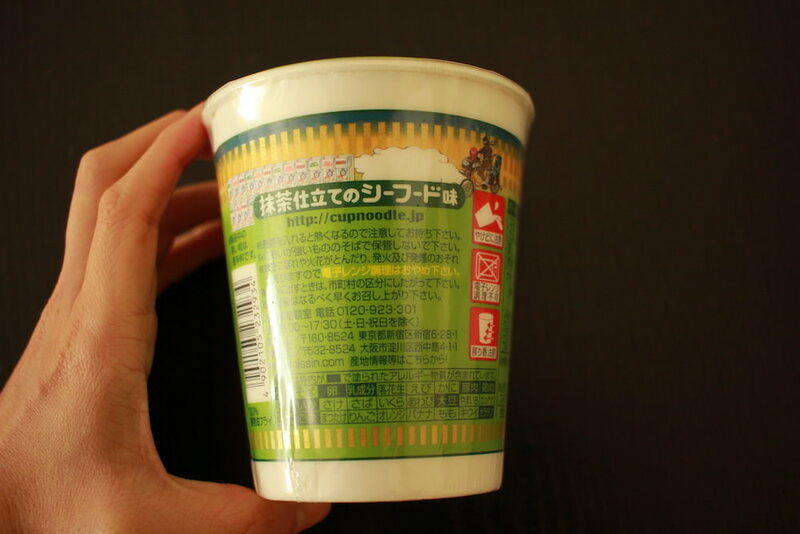 This is my tasting report of matcha green tea flavored CUP NOODLE! 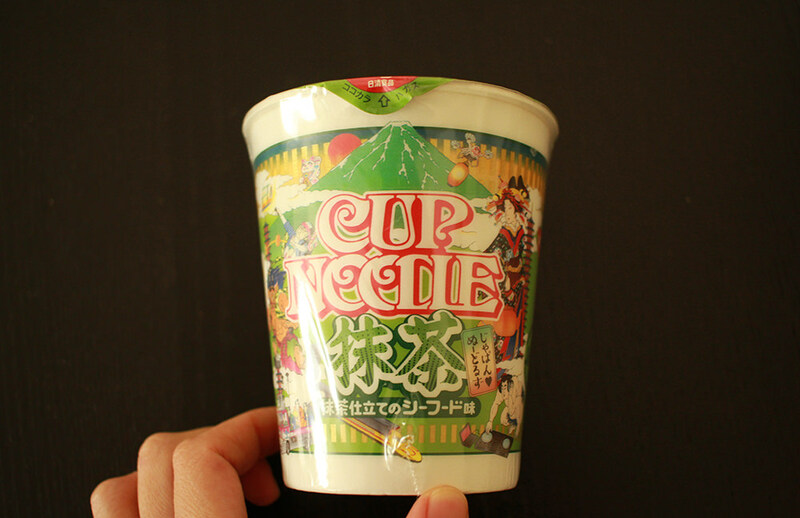 The package is actually cuter than the usual CUP NOODLE. It has got all sorts of illustrations of motifs related to Japan from traditional to new. Such as Sumo wrestler, sakura flower, Mt. Fuji, Shinkansen, temples, etc. It’s especially funny that the Sumo wrestler is doing something with a laptop! Haha. Matcha green tea CUP NOODLE’s packaging, front. Matcha green tea CUP NOODLE’s packaging, top. atcha green tea CUP NOODLE’s packaging, back. Even at the back has got illustrations! Because the packaging is cute, I thought this might be great for a souvenir to give to your friends and families. The illustration is somewhat Ukiyo-e like, so people can instantly recognize that this is from Japan. 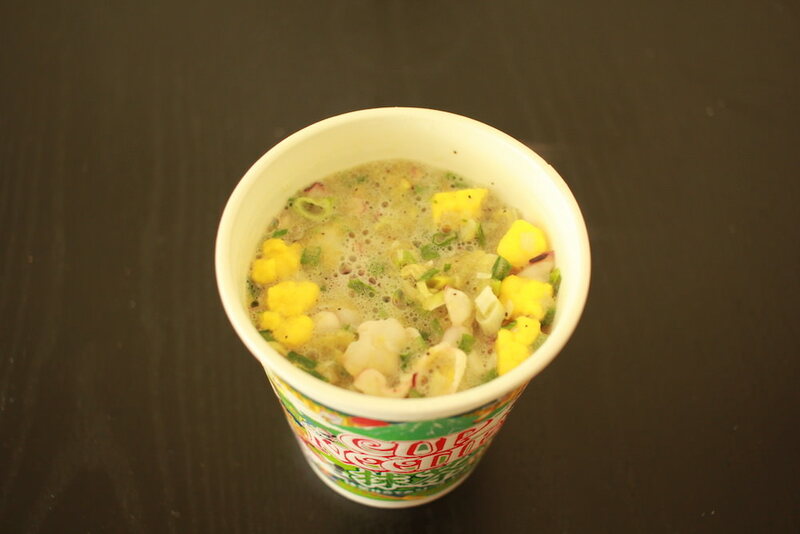 It was very similar to the normal seafood flavor CUP NOODLE. Matcha green tea CUP NOODLE inside. The light green powdery pieces may be matcha soup? Let’s eat! How is the taste? The making procedure is the same as normal ones: pour boiled water and wait for three minutes. Three minutes! Time to eat! Tada~! There were many bubbles on the top, looked like matcha latte. Can you see the color of the noodles? It’s green! Nisshin put matcha powder into the noodles as well. The green noodle is so unusual! For soba noodles, there is a kind called “Cha-Soba”, which mixed matcha powder and soba powder to produce noodles. 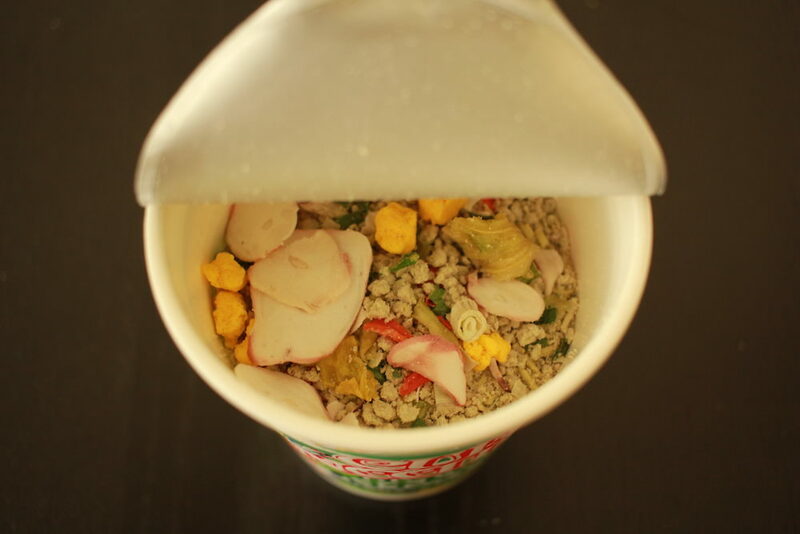 It has got a great scent, and matcha green tea flavored CUP NOODLE borrowed the idea from Cha-Soba. The seafood soup was very creamy, so I did not recognize any bitterness from matcha. What I thought is that it might be bitterer. It was kind of like seafood flavored matcha latte! The creamy soup stuck to the noodles very well, so it was very tasty. The toppings were delicious, too. They had chewy textures of octopus and squids, and eggs were sweet. I liked it pretty much, actually! 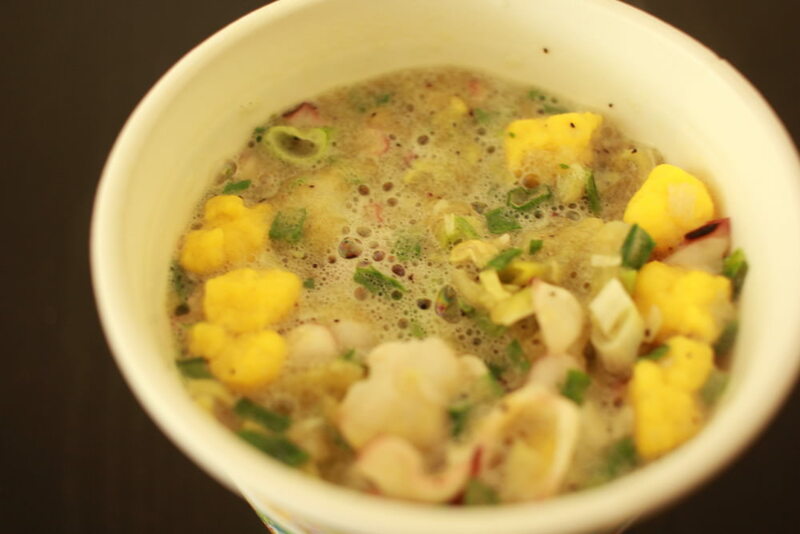 It reminded me of the “milk seafood” flavored CUP NOODLE which is limitedly sold in winter. Got interested in getting one? 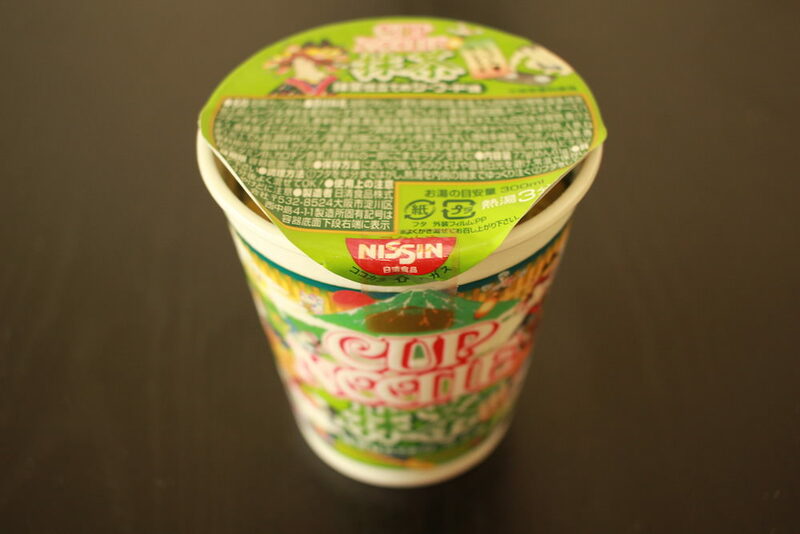 Matcha green tea CUP NOODLE is a limited sale. Hurry to convenience stores in Japan to get some for you and your friends, families! 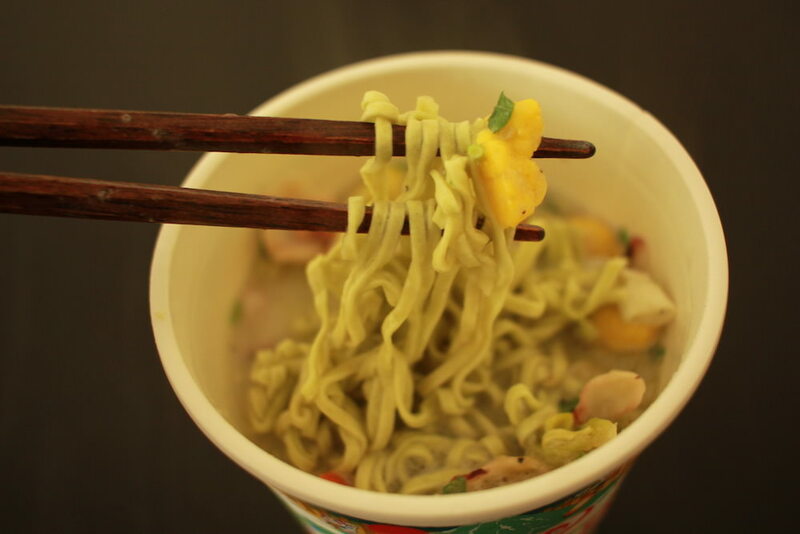 Taste Matcha Green Tea Cup Noodle in Japan, the brand new flavor! 5 Best Places to Buy Green Tea in Tokyo For Your Souvenir!